This is a really quick and easy bread to prepare for your family breakfast or brunch. On weekends Carlos always like something sweet with his morning coffee so I will usually bake this. You can make and bake this in half an hour. The secret is using the store bought Pillsbury bread stick dough. I will always have a tube or two in my fridge for a quick and easy bread. You can make this into sweet or savory bread. For this bread I added cream cheese and blueberry to the filling. 1) Preheat over to 350 degree F. In a bowl combined soft cream cheese, powder sugar and egg yolk. Mix until well combined. 3)Spread cream cheese mixture onto the centre of the dough. Sprinkle the blueberry on top of the cream cheese. (pix 2) Separate the dough perforations up to the cheese mixture (You might need a scissors for this) Slightly pull and stretch the dough strips. 5) Beat the egg white and brush it all over the loaf. Bake for 20 minutes or until golden brown. Cool the loaf. 6) Combined the powder sugar and lemon juice. Whisk until smooth. Drizzle all over the cool loaf before serving. This curry is deliciously rich and thicker than other Thai curries. I used the ready-made Thai curry paste which you can get from the Asian supermarket. As this is a quick curry dish so be sure to use good qulity meat. I used sirlion for this dish or rump steak will be good too. 1. Put the coconut milk into medium-sized sauce pan over medium heat, add the curry paste, kafir lime leaves, lemongrass and slowly bring to a boil, stirring constantly for 5 minutes. 2. Put in beef strips and cook for 5 minutes. Then add in the water and cover to simmer. 3. Meanwhile in a bowl, mix the rest of the ingredients except for chili. Add this to the curried beef, and simmer about 15 minutes or until most of liquid evoporated. Add in fresh chili, stir well, and remove from the heat. 4. Ready to serve. It is best served with steamed rice. 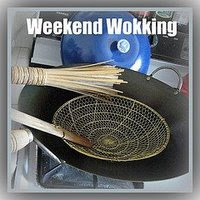 I'm submitting this recipe to Weekend Wokking , a world-wide food blogging event created by Wandering Chopsticks celebrating the multiple ways we can cook one ingredient. The host this month is Preciouspea and the secrect ingredient is Coconut. The round up will be on the 1st October 2008 so do check out her blog. Note : Sorry for the poor picture quality. The weather is really bad and gloomy and I just took a few shot of it. With all our Muslim friends busy baking cookies for Hari Raya I thought I wanted to join in the fun. I baked some Pineapple Tarts. Of all the cookies this had to be my all time favorite and I just can’t have enough of it. Sometime I wonder why people sell or bake these tarts only once year. It’s such a treat and it should be available all year round. Maybe it’s because making this involves a lot of work, that is why it’s so special and you get to eat it only once a year. 1. Cook grated pineapple in a pot/wok with sugar and cinnamon for about 1 hour, stirring occasionally. 2. Cook until the pineapple jam dries and leave the sides of the pot. Remove from stove and set aside to cool. 1. Cream butter and and sugar in a large mixing bowl until light and fluffy. 5. 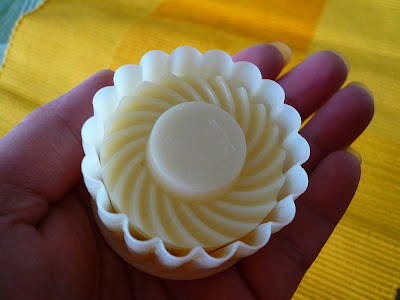 Roll out the dough about 0.5cm thick and cut into shape with a pineapple tart mould. Fill the center of tart with some pineapple jam. Repeat until the dough is finish. 6. Bake the tarts in a pre-heated 350 degree F until golden brown. This might take about 15 - 20 mintues. Cool tarts on rack before storing it. These bars make a delicious and easy alternative to apple pie. It combines two of my favorite food which is apple and the crumble topping. It is an ultimate comfort food served with a scoop of ice cream. You can used any kind of apple for this bars. 1. Peel, core and coarsely dice apples. In a large skillet, combine apples, sugar and cinnamon. Cook over medium heat, stirring occasionally for 5-7 minutes, until apples are tender but still firm. In a small cup, combine cornstarch and lemon juice. 2. Add to the apple and stirring constantly for 3 minutes or until thickened. Dish out and set aside to cool. 4. In a medium bowl, combined flour, sugar and salt. Mix well. Rub in butter to the flour until its crumbly and resemble breadcrumbs. Press into the bottom of the pan. Bake for 10-12 minutes, until lightly brown around the edges. Remove from oven. 5. Spread the jam evenly on the base while it's still hot and top it with the cooked apple. 6. In a medium bowl combine all the ingredients for the crumble. Mix until well combined and crumbly. Sprinkle over the apple. Bake for 25-30 minutes or until golden brown. Remove and cool. Cut into squares and serve. I like making focaccia over the weekend as Carlos and I can munch on it the whole day without me worrying about cooking lunch or dinner. If you're new at bread baking, focaccia is great way to start because it's pretty forgiving. As for the topping you can go minimal like brushing with a bit of olive oil, salt, and pepper or you can pile up the toppings to produce a thick-crusted pizza. Personally my favorite version is to drizzle the dough with olive oil, season with salt and pepper and add a thin layer of caramelized onions (3 onions cooked with olive oil until nicely browned) and top it off with some home grown cherry tomatoes and some olives. Bake until golden brown and then garnish the finished bread with a bit of shredded basil. Carlos and I both love Japanese food. If we want some good Japanese food we will drive all the way to Delaware for it. There are times I will try to make some if I can find some very fresh tuna fish. This time I tried something different. I made some sushi with Prosciutto and lobster. Some of you might think its weird combinations but actually it turn out pretty well.